Isn’t it beautiful?! It’s a 3-tone kitchen, which I love. AND it incorporates the color I am most obsessed with… NAVY. Now you know I designed it! Plus it’s a space where we reused a lot of the existing. I love behind-the-scenes footage and what goes into the end product. If you want to know more about how the kitchen evolved + take a peak at what happened behind the lens, this post is for you! Stylist/Producer for BHG publications, Donna Talley and I have been working together for quite a while now. She has rewarded me so well in helping me grow my exposure in the publication world. Last year when she was scouting a project that I had recently finished, we started discussing the potential for a kitchen makeover. In the meantime, Marie McCartan, Editor of KBMO was visiting the area scouting projects with Donna. After some back and forth, they were sold on the kitchen of a clients home that I had already been working with on other interior updates. The clients kitchen was fairly functional, but there were some major needs + a few wants, plus the overall aesthetic of the existing space was worn and dated! 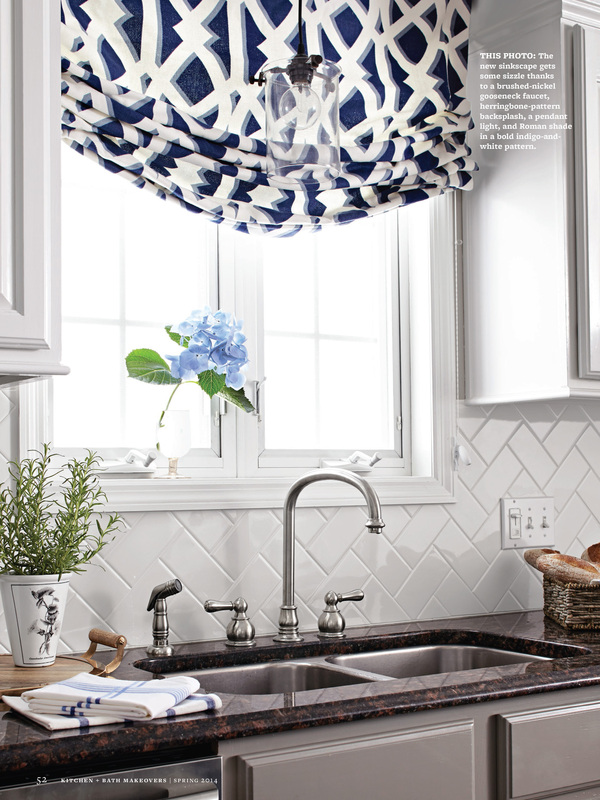 The perfect combo for a kitchen remodel for KBMO. After the design of the kitchen was set, I pulled my construction team together and we came up with a plan for what was to stay and what needed to be changed/updated. In the end, much of the existing kitchen remained, including all the cabinets around the perimeter and the countertop. Our focus for the remodel was the island and the refrigerator area. The ‘before’ island was small and there was so much extra space that wasn’t being used. The ‘before’ refrigerator area was also an eyesore. The overly large appliance took over the kitchen + the traffic flow so by making the decision to upgrade it to a counter-depth model and adding a central command center on either side, the refrigerator no longer was the dominate element. Along with the island and the refrigerator space, one of the biggest changes in this kitchen was how my team and I heightened the upper cabinets. You may not believe it, but the upper cabinets in the ‘after’ are the same as before. To give them the appearance of taller cabinets, we added decorative mouldings above the cabinet, below the cabinet, and new crown moulding around the entire kitchen space. For the remainder of the cabinets that remained, we updated them with a few coats of paint. It’s amazing what paint can do! The entire renovation took about 2-3 months and even though to the homeowner (like all homeowners who live through a renovation) it felt like an eternity, the end product was well worth the wait! What I have found so interesting from the many photoshoots that I have been apart of is that the finished product (in the viewer of the camera which is then published in the magazine) ALWAYS looks incredible, yet there is a lot of work that goes into each shot. Seeing some peaks into the space behind the lens always intrigues me, and hopefully will for you as well. I don’t want this to take away from how beautiful the space actually is because it is incredible and ALL REAL. But know that it’s work to create the perfect shot. In the end, this kitchen was the career highlight of my 2013 year. And now I get to enjoy it again in 2014. 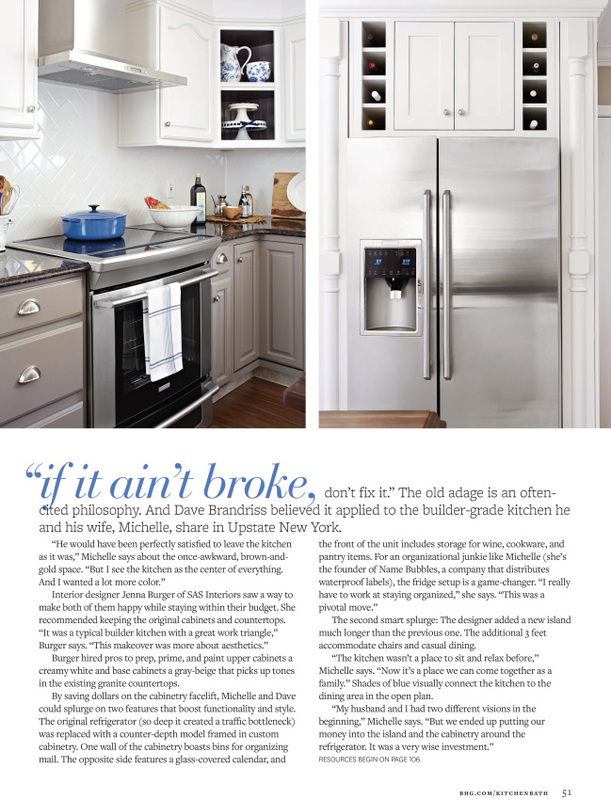 There are so many amazing solutions that we came up with and “using what you have”, MY MOTTO, is all over this kitchen. In the end, it was the amazing elements and layers added to the space that made it what it became. These are some pictures that I took with my camera – definitely not pro level like Laura’s images. Also, the images that I took are at different angles than the ones seen in the magazine, so I encourage you to grab your own copy and be inspired! And this kitchen has 2! Side 1: 2-month calendar (click for the printable) with glass overlay which you can write on + plus a framed cork board. Side 2: a clock + tons of cubbies for mail, school papers, newspapers, and more. All of these cubbies are built-in, but I was inspired by the central command center I made for my home. Plus 2 floor-to-ceiling pantry pull-outs. They are about 6-8″ wide, so they hold a lot of food an typical pantry items. It’s GORGEOUS! I honestly love everything about that makeover. 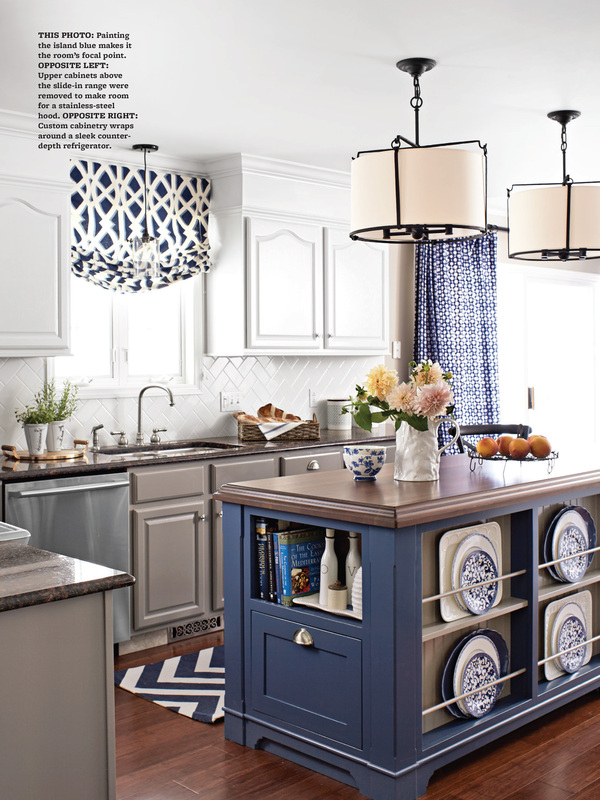 I adore blues and grays, so this is definitely a “me” kind of kitchen. Ha, I love how you said it’s a “me” kitchen. Glad you like the outcome as much as I. It screams “me” too!! Oh my gosh YES! It’s beautiful! How amazing! This is absolutely stunning! I don’t know if I love the command center or navy more!!! Thanks Amber. Yes, those are definitely my two elements of the kitchen too!! 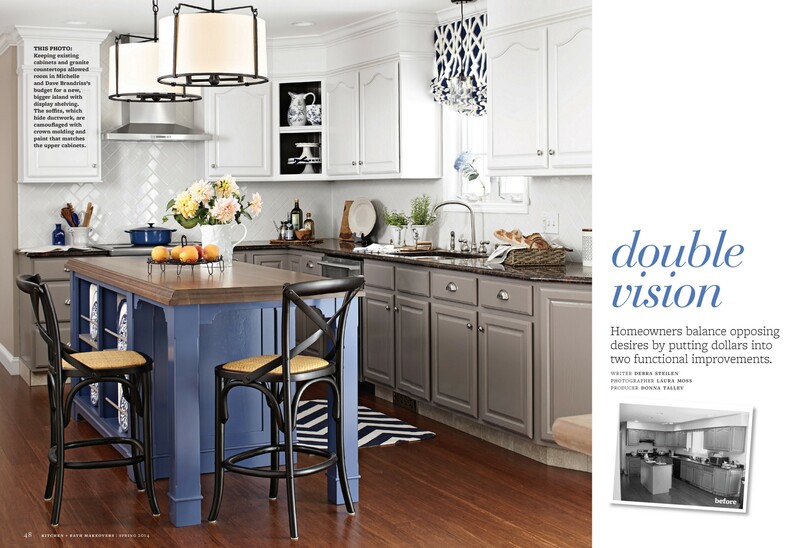 Beautiful kitchen and congrats on having your work on the cover! This is totally amazing. Congrats!!! Congrats, Jenna! That’s so exciting! So so so exciting!!! That blue island is seriously SO amazing, I love it. Man, what a long process to come to fruition–a year??? You did an amazing job, love that command center, too. Come to my house next??? Looks totally awesome. Can’t wait to get the issue. Such talent you have. Awe, thanks Shannon for your kind thoughts – so much appreciated! jenna, congrats on a beautiful kitchen. everything is perfection. best of luck in the upcoming project as well. Wow, Jenna! This kitchen is amazing! I especially love the colors and the island. Did you just transform the existing island? It’s so much more functional now. Congratulations!!! So happy for you! Thanks so much Karen for your kind thoughts. Yes, the island is all new and that is one of the elements that I mentioned in the post was the “upgrade” of the kitchen. The old island was much smaller and left a lot of space unused. Famous, ha… no, lol, but thank you though for saying that – so sweet! Jenna! I am so excited to finally see the finished product on this shoot! I am so thrilled for you, my friend! It is just beautiful. I would love a source for those dining chairs! That blue stripe is amazing! You are so kind Beth – thank you! 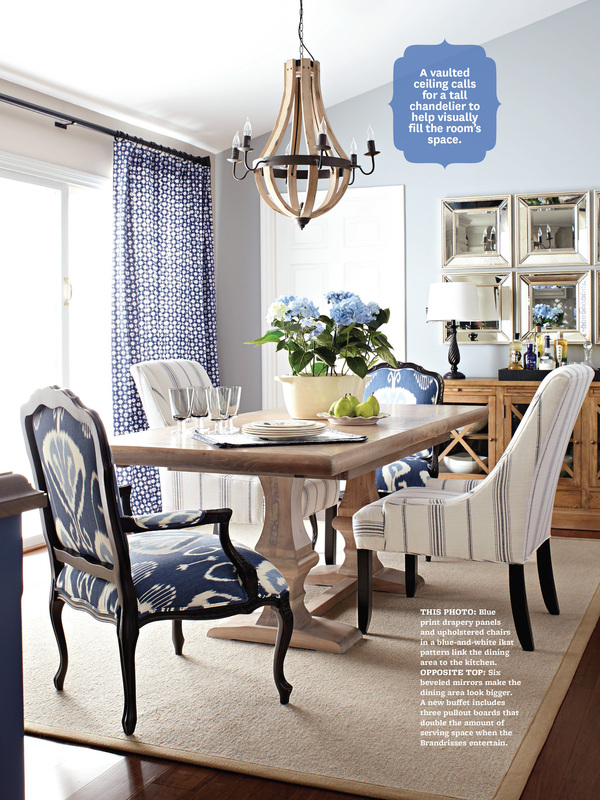 Most all the furniture is from Ballard Designs – they were a huge sponsor for the project, as well as Shades of Light. What a stunning kitchen! It is really hard to believe it is the same space. Love the seating element that was added to the island! Thanks so much Lindsey. Yes, the seating element at the counter is a huge addition. You did an awesome job. It looks amazing! Jenna! That is so exciting!! Congrats on the cover, and the amazing the design. 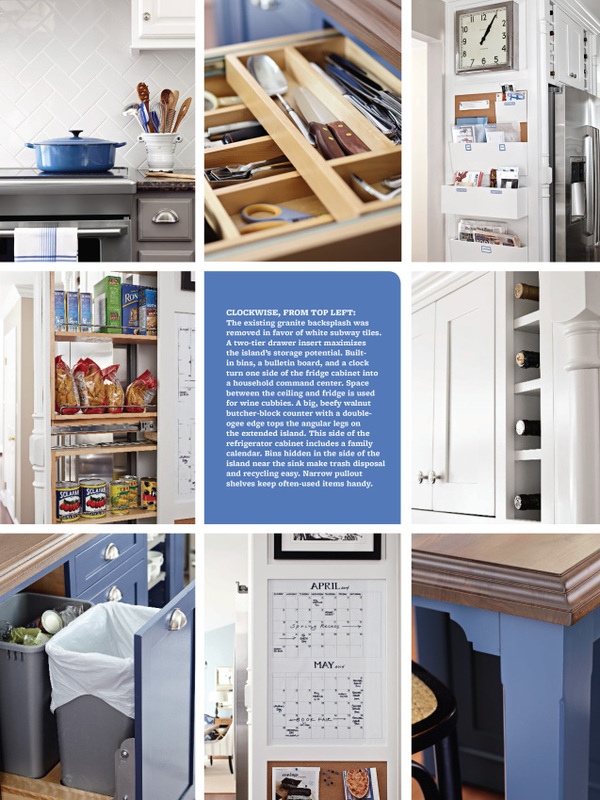 My favorite part is the narrow pantry storage hidden beside the fridge!! This kitchen is amazing!! I have a very similar kitchen and we have been wanting to do something very similar to our soffit (add molding and make the cabinets and soffit look seamless with molding). I noticed in the before picture that this is quite a bit of a lip on the soffit. How did you create the look? Did you add depth to the cabinet uppers? Thanks Megan! Yes the soffit before did hang over the cabinets, but the cabinets were never removed. Instead we demo-ed the existing sheetrock and adjusted the framing behind, then put up new plywood sheets (instead of new sheetrock) and added the moulding. Every condition / situation is different, but that’s how we tackled this kitchen. Sometimes the “lip” isn’t there or isn’t such an overhang. In this case the “lip” was about 1″. If there was more room between the lip and the top of the cabinet door, we could have added a simple piece of moulding, but unfortunately there wasn’t. I hope this helps! Beautiful! This is exactly what’s been in my head for my kitchen!!! Does the issue specify your paint colors? Love how you solved the soffit “issue”. Great job! Jenna, we are painting our cabinets white, and ours are like the ones above with the older style of the exposed hinges. I didn’t know you could change those to the hidden hinge – was that hard to do? Love the “higher” cabinet look as well! 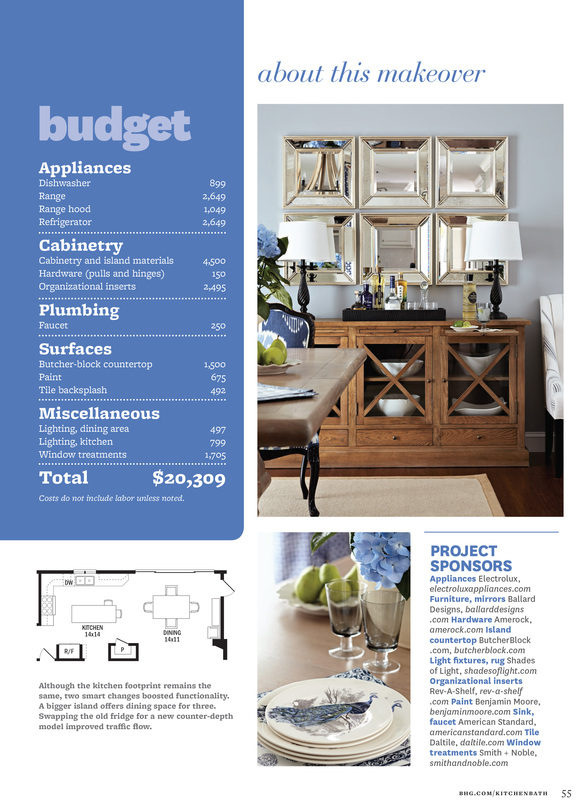 are you able to disclose the 3 paint colors you used in this project?? It looks awesome!!! I Jenna, I found this on pinterest and i have move to Hawaii and bought a much older home and i want to do this to brighten it up. I noticed the colors you have posted here and I went to home depot, and Benjamin Moore and no one knows them names. Are they gone do you think or do you know the numbers to those colors?